We’ve all been there – sitting in a math class, taking a test or quiz, and you completely blank out on a formula you know you should have memorized. It’s not that you don’t know how to use it, or where it’s applicable, it’s just that it’s hard to both learn a concept and memorize information simultaneously (especially if you’re like me and work on a relax/procrastinate/cram the night before schedule). This tutorial explains how to type up information on your computer and transfer it to your TI calculator to easily view at any time. Before we begin, I’d like to explain a few things. 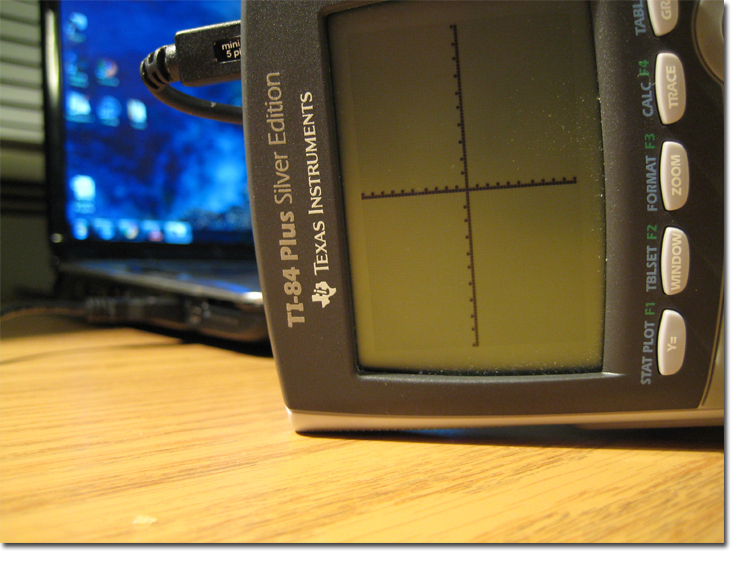 First, I’ll be using a TI-84 Plus Silver Edition, because it’s the recommended calculator for my math courses. 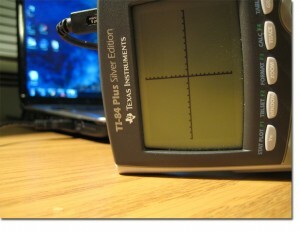 However, the software provided by TI claims to work with all of their calculators. The file editor I use only works for TI83/84, but I’m sure there’s something similar out there for the TI-89. Second, it’s perfectly possible to type up your information on your calculator, but given the layout of the keyboard and the requirement to either be in text mode or number mode (when most formulas require both, even “3t” requires switching modes), it’s quite cumbersome and annoying. Third, check to make sure this isn’t against cheating policies – while it is inherently different from bringing in a cheat sheet or having knowledge of the content of the test ahead of time, having any form of outside help may be considered cheating. 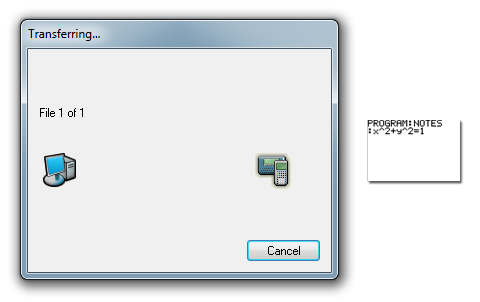 The goal here is to utilize the calculator’s ability to store programs. We’re not actually going to be programming, but we’ll use a program to store our notes. 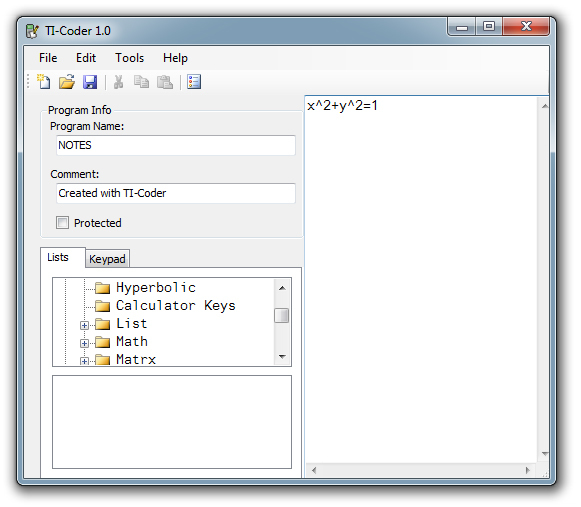 Programs can be written on the computer and transferred to the calculator, and then edited on the calculator, allowing you to see the contents. Open up TI-Coder, name your program (note that the name will be what appears on the calculator’s list) and type up whatever notes you want in the right panel. If you need special characters, use either the list or keypad module to access the functions you can use on your calculator. When you’re done, hit save and put your program on your desktop. In case you were wondering, here’s why we can’t use a regular text editor like Notepad to do this job. TI uses a file extension of “.8xp” on their programs. 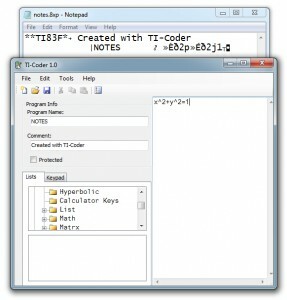 It appears that the file format encodes characters in some odd way so that the calculator can read them – if you open up a file in Notepad, you’ll find that most of the characters are odd Unicode symbols. It’s a good idea to split up notes in different programs by some kind of category, because the calculator screen is very small and you’ll have to scroll up and down a lot to access information. At this point, you can plug in your calculator and open TI Connect. 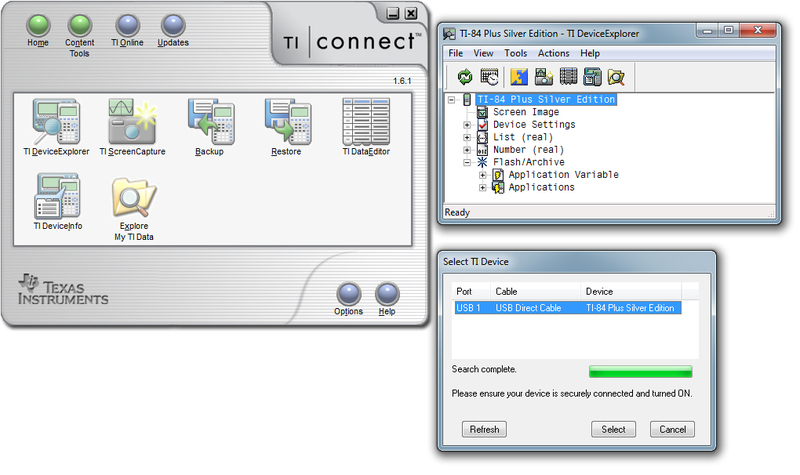 Within TI Connect, select the icon on the top-left that says “TI Device Explorer”. 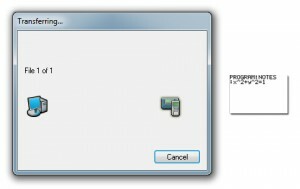 A window should pop up showing that your calculator is connected via USB, press Select, and the TI Device Explorer should open up. You can now drag your .8xp file(s) from your desktop into the TI Device Explorer. It will take a few seconds to transfer, the device is pretty slow. However, once it’s done, you can disconnect your calculator and hit the PRGM button. Select Edit, and then choose the file you want. Press Enter, and you should see whatever notes you typed up on your calculator. Good luck on your test! Beware of the “CLEAR” button. Hitting it once while a line is highlighted will erase that line, with no way to get it back because the TI calculator isn’t a real text editor. If you’re worried about being caught with this information, remember that a quick and easy way to delete everything in your program memory (and potentially other work you have saved on the calculator like recent calculations) is to hit the blue “2ND” button, then the “+” symbol to access the memory management menu. Choose option 7, which is “Reset”, and then choose option 1 which is “All RAM”. You’ll be warned that this will erase data and programs, which is exactly what you want to do. Choose Reset, and you’ll be shown a message that RAM was cleared. You should practice doing this quickly in case you’re caught in a bad situation. Worried about your students using this method for cheating? In the section above I explained how to clear all programs out of the memory of the calculator. After doing this, a dialog box appears showing that all RAM was indeed cleared. If you so choose, you can require students to follow those steps and show you the “Memory Cleared” dialog box before you give them their test. After that, anything they enter into their calculator will have to be from their own memory. If you have a large class or this is unfeasible, you can choose random students and check their calculators’ program lists. The threat of possibly being targeted will reduce the number of students attempting to bring in outside information. That being said, your students will dislike you for it, but realistically they already should dislike you for requiring them to use a TI product. Note: I do not provide technical support for the TI Coder software. If you are having difficulty using it or receive an error message, please contact TI directly. Comments about technical issues will not be approved. I was looking for info on connecting my PC to my TI-84+ SE, but stumbled upon this. Great info! Thanks for sharing! I’ve got a Statistics exam next weekend and can really use this. I don’t consider it cheating at all, as the human mind can only store so much information for easy, quick recovery. There are just some formulas that I need to know. I feel like I can breathe a little easier. GREAT WORK MY MAN!!!!!!!! HAVE MY FINAL TOMORROW!! I am a highschool teacher in physics and I want my students to use this method to get all those stupid formulas into the calculator. There is no need to know them by heart. This was great man, thanks a lot! The last tidbit about your students already not liking you cracked me up! You are awesome! I went to geek squad and to a computer tech store and no one could help me figure this out. It has taken over a month. I ran across your site about an hour ago and it took me a little to work out the kinks but I got it!!!! I am so grateful! Thank you so much for the tutorial, this greatly helps me in more ways than cheating, it is nice to be able to have notes to refer to without having to spend countless hours typing them in with the calculators keyboard. Very much appreciated! Thank you! If you ever need professional advice about spectroscopy, I owe you! Thank you very much! This will help me a lot! THANK YOU SO MUCH!!!! This helped me pass my college algebra course!!!! Awesome! Just needed to say thank you for doing this! Thank you SOOOO much!!! this was so easy & works great. I’m using a TI-84 plus CE and the lists I need are so clear. On way to passing Chem with your help! THANK YOU!!! This tutorial was so helpful! You are awesome, thanks so much!!!! You rule. About to wreck Accounting. Been doing it the long way by hand for 7 years, THANK YOU!!!! I downloaded as recommended. I ordered my usb cords from Amazon. I entered my notes while I waited for Amazon to deliver the cords. Just got it today. Finished the transfer today. It looks great on my calculator. My finance test is tomorrow. Thank you SO much! This will really help me out. Been 8 years and you’re still helping students today. I will spread the word. Your knowledge shall impact many lives! Thank you! Does anyone know how to use the 2nd button on the “keypad” in the program. I would like to type pi but left clicking and right clicking the 2nd button doesn’t work.